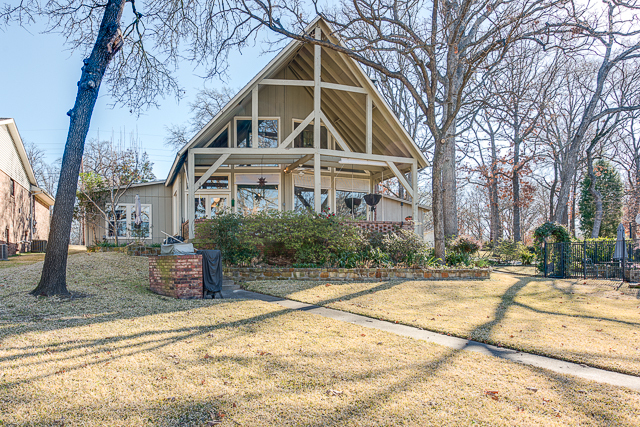 Lakey & charming A-frame waterfront home on 2 lots has so much versatility. Open Liv-Kit-Dining has cathedral ceiling & soaring wall of windows plus WBFP. 3 bedrooms & 2 baths down (1 could be office/sunrm). Upstairs 20×22 loft perfect for guests and bath w/shower. Galley style kit is open to living & has breakfast & wet bar, double oven & tile countertop. Outdoors is versatile with inground swimming pool, garage/cabana, covered lakeside porch, patio off the enclosed boathouse that is large enough to accommodate a 20’ boat. Lots of room for guest parking. Located in highly desired Star Harbor which has a 9-hole golf course, lots of wildlife, and city services. If you have been reading my posts on Facebook, I’m going to be migrating to WordPress for my blogging. As you can see I’m interested in so many different things. First and foremost, I’m a realtor with Ebby Halliday REALTORS at the Preston Center. So, I blog about homes, home decor, area entertainment, DIY and many other related things. I also admit to being a Pinterest junkie, so check out my Pinterest board. Real Estate – I am in servant leadership. There is something so satisfying about getting a young couple in their first home; helping an elderly couple transition closer to their family, or simply getting a home sold for someone who is ready for a change. Making things myself whether it is homepathic medicine or DIY techniques for the house. I believe that the reason some of us are so sick is because we don’t even think about what is in our food and medicines that we take. I am an Advocare distributor. Advocare is an elite nutrition way of life. The products are phenomenal. My husband can’t live without his MNS-E and I love the ThermoPlus, Catalyst, and ProBiotic. I am a Young Living Distributor. Again I would rather go back to Homepathic medicine for some things. Essential Oils can do a lot of things for a lot of people and it makes you and your environment smell good. Check out my Pinterest board regarding EO’s. My family – Family is very important. My husband Bruce and I married in 1980 and we are still happily married. We have three sons – Brent is an Arlington Firefighter and married his Aggie sweetheart Hillary. They have a little boy, Boone (born 2012) and sweet daughter, Gray Elise (born 2014). Justin is a DFW paramedic and has a carrot-topped little boy, Barrett (born 2013). Our son Ryan, Children’s Ministry Director for Bethel – Dallas is married to Hannah and they also have a little boy, Nolan (born 2014). When DeDe & Pops aren’t busy with real estate then these 4 precious grandchildren keep us running.